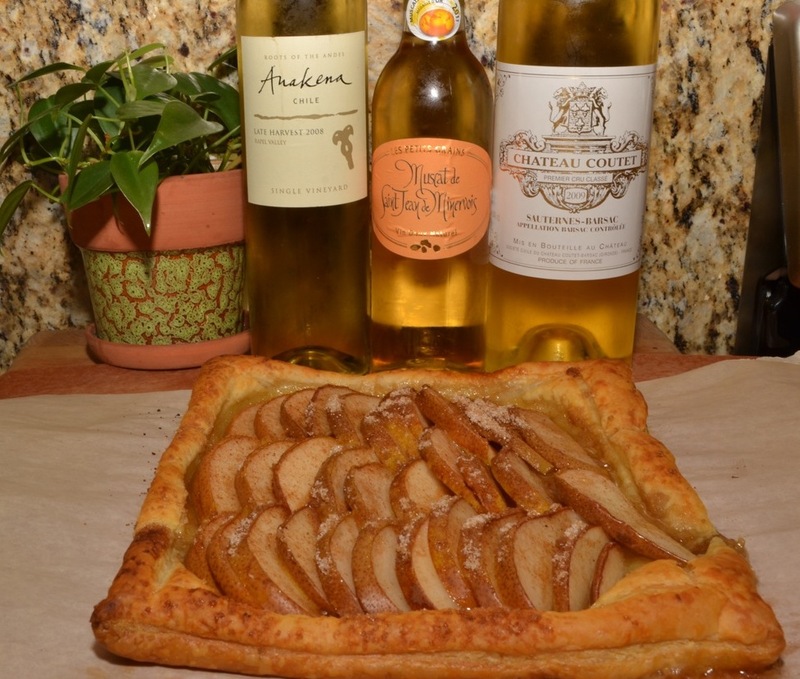 While any day is a good day for dessert, a holiday is the best excuse to enjoy it with a dessert wine. When Harry & David asked if I’d like to host a giveaway (end of this post) of one box of their organic Royal Riviera pears during the holidays, I knew it would be a great excuse to make an easy but delicious dessert, and pair it with some sweet wines. 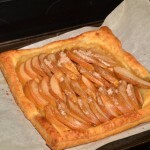 I asked friends for a pear tart recipe, something to remind me of the one I had when in Paris. My friend Linda gave me this easy, 5 ingredient recipe that came out perfectly. I then paired three different dessert wines, and euphoria ensued. The most important ingredient for the tart, of course, is the pears. They need to be perfectly ripe, sweet, juicy, and healthy. Harry & David’s organic Royal Riviera pears were just the ticket. These pears are included in just about every Harry and David gift basket, and like most tree fruit, they’re not genetically modified (non-GMO). Harry & David’s 80th anniversary is next year, and they still use all natural grafting methods, instead of genetically modifying the seeds. Though Harry & David did provide the pears for this post and the below giveaway, I have been a loyal customer personally as well on a corporate level for years. 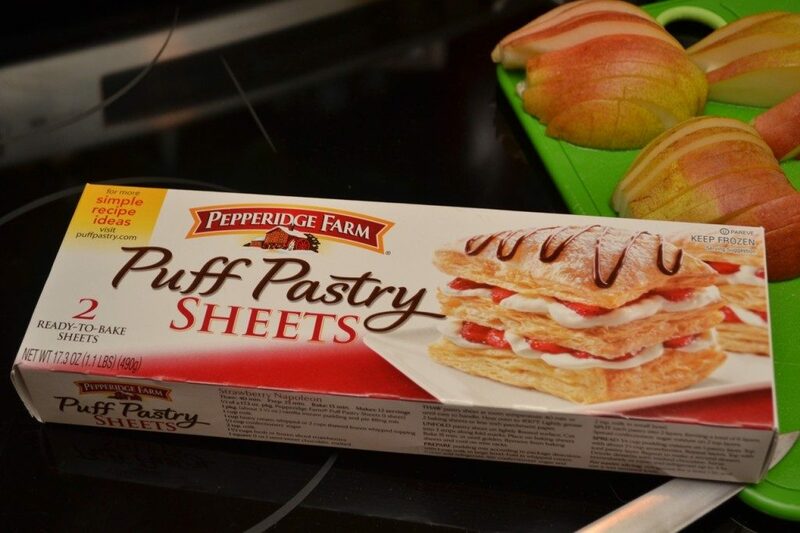 For the tart “crust”, I went with a frozen puff pastry dough from Pepperidge Farm. It was not the size and shape I wanted, but it worked just fine. Before you start cutting and layering, mix up the sugar and spice ingredients in a medium sized bowl and set aside. 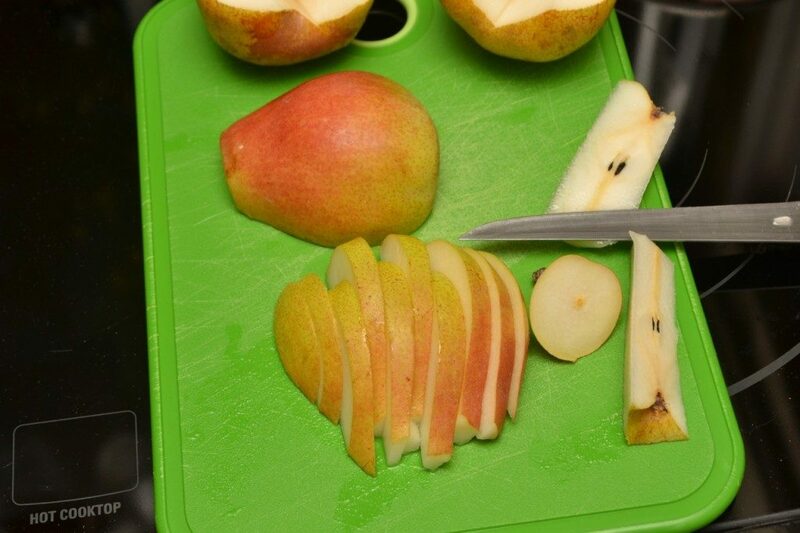 Slice the stem and very top off of the pears and then slice the pears in half lengthwise. Then, use a paring knife and cut out the core. 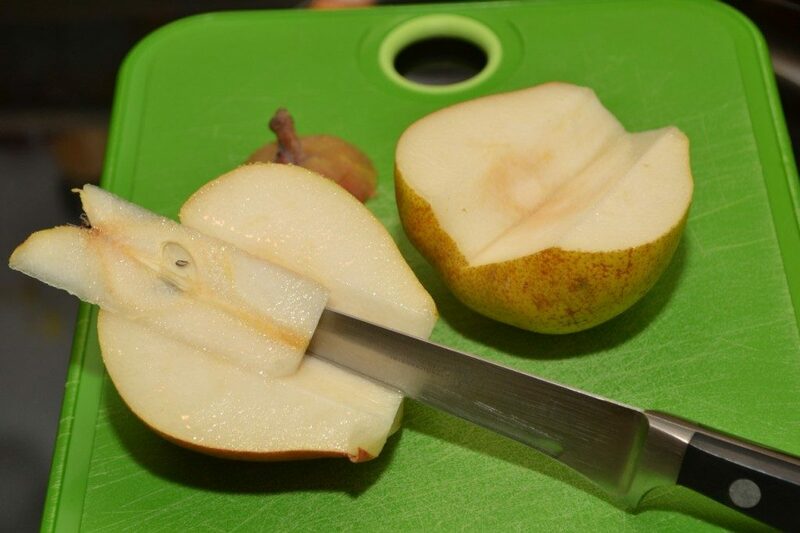 Next, place the pear flesh side down, and slice lengthwise about 1/8 to 1/4 inch thick. Once the pears are cut, unfold the dough, placing it on a parchment paper lined cookie sheet. 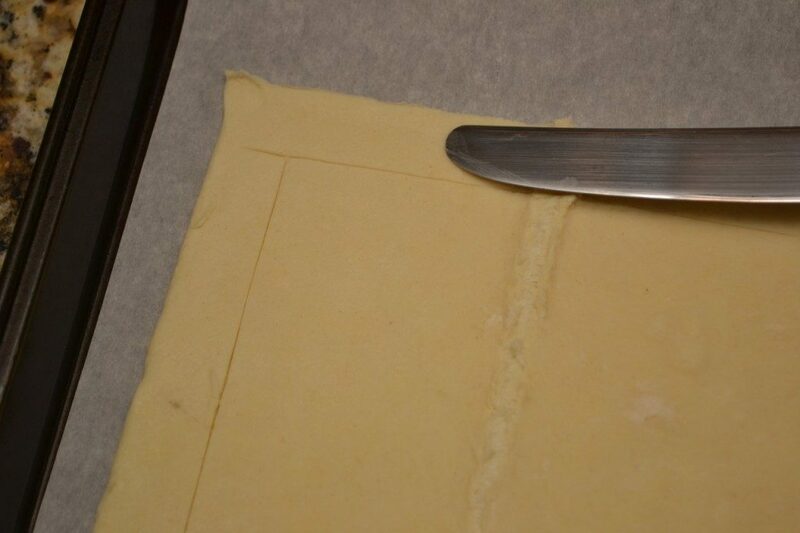 The Pepperidge Farm dough was about 9″ square, and I traced a border of about 1″ around it with a butter knife. Be sure not to go all the way through the dough. 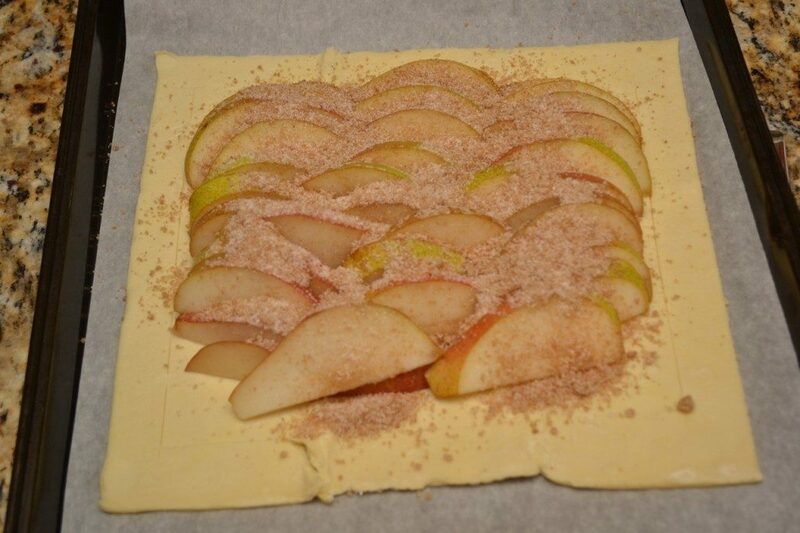 This 1″ border will cause the ends to puff up around the filling when cooking, and create edges around the pears. I would have preferred the dough’s width be about 8″, and then the 1″ border would have made for a much more narrow tart. I was a little skeptical at first that tracing a thin border would create the puffed edges, but it really worked. WHO KNEW?! Next, begin layering your pear inside the center of the dough. Be sure the larger end of the pear is closer to the traced line, and have the pears overlap. Try to use the smaller outside pieces of pear first, as a bit of a base. That way, the longer pieces will line up nice and upright. Be sure you don’t leave too much space between the pieces. Once your pears are layered nicely, being sure not to leave too much open space in the middle, while not going over the border, sprinkle the sugar mixture on the top. Place the tart in the refrigerator while you preheat the oven to 400. It should stay refrigerated about 20 minutes. 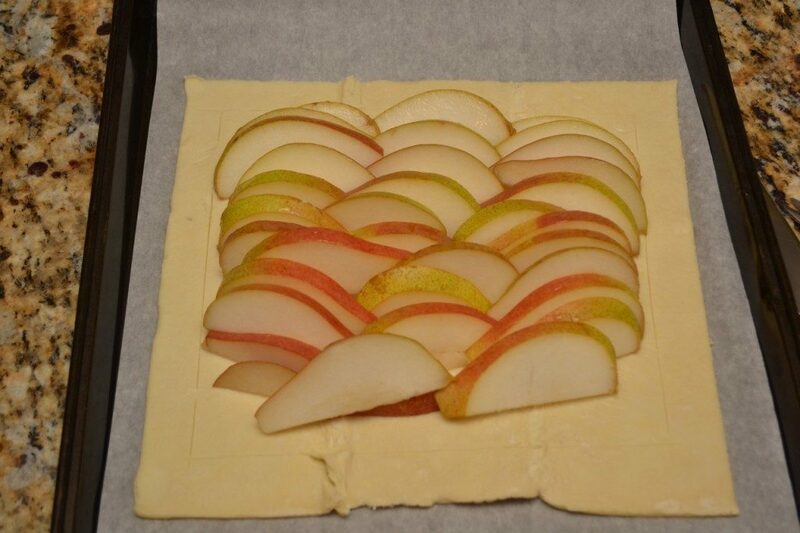 After 20 minute refrigeration, place your pear tart in the oven. Set the timer for 15 minutes. When the timer goes off, reduce the oven temperature to 350, and set another timer for 10 minutes. When the timer goes off, if the crust isn’t golden brown and crisp, give it a few more minutes. Once finished, remove from oven and let cool. Now, on to the dessert wine! Pairing wine with sweets has one general rule: your wine must be as sweet or sweeter than your food. If not, the wine may taste muted or bland after tasting the dessert. That said, I’ve selected a trio of dessert wines to pair with the tart. They each come from a different region, and are made with different grapes. I will say that the Sauternes from the amazing Chateau Coutet pictured above was not opened for this tasting. It was a full sized bottle, as opposed to the typical 375ml half bottle you’ll find for white dessert wines. I therefore chose to open another, quite delicious bottle of Sauternes to avoid any waste of the Chateau Coutet, since I was the only taster. 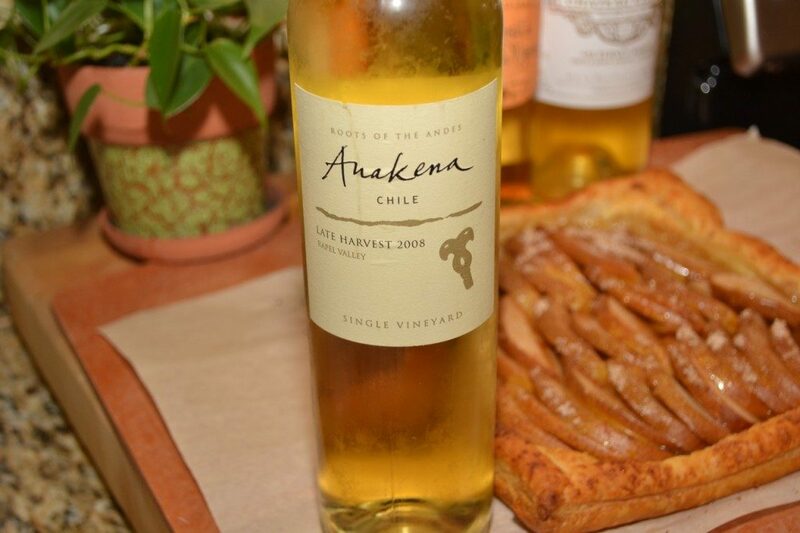 Hailing from Chile, the Anakena Late Harvest 2008 ($20) was the least sweet of the three wines. However, it was still a perfect pair with the pear tart. Made with 85% Viognier and 15% Muscat of Alexandria, the Anakena Late Harvest 2008 was not heavy on the palate, and still a bit crisp. The nose and palate were delicate white floral and dried apricot, with decent acidity. It’s not as heavy or viscus as a Sauternes, and there are no honey notes that are found in the other two options. However, this is definitely the best dessert wine pairing if you are not typically a sweet wine drinker. 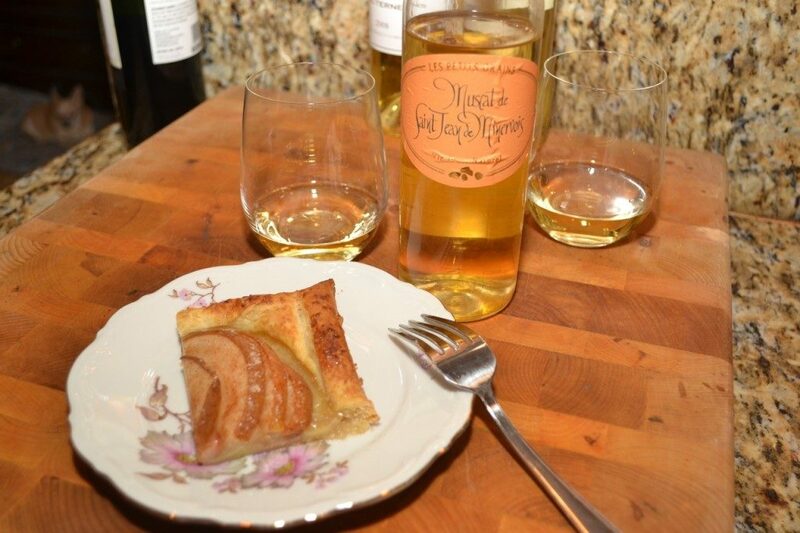 From the South of France, I paired Les Petits Grains 2011 Muscat de Saint Jean de Minervois ($15) with the pear tart. Made with muscat grapes, the Muscat de Saint Jean de Minervois uses the noble Muscat a Petits Grains variety of grape, different than the Muscat of Alexandria in the Anakena Late Harvest wine, though from the same family. The commune of Muscat de Saint Jean de Minervois was named after it’s famous muscat wines in 1936, and was originally Saint-Jean-de-Pardailhan. The bouquet of the Les Petit Grains 2011 was unimpressive, and perhaps a little plastic. However, the palate is much different. A very viscous wine, there are delicious floral and honey flavors mixed with spiced orange rind, and laced with dried apricots that dance on the palate. This was an excellent option to pair with the Harry & David Royal Riviera Pear inspired dessert. 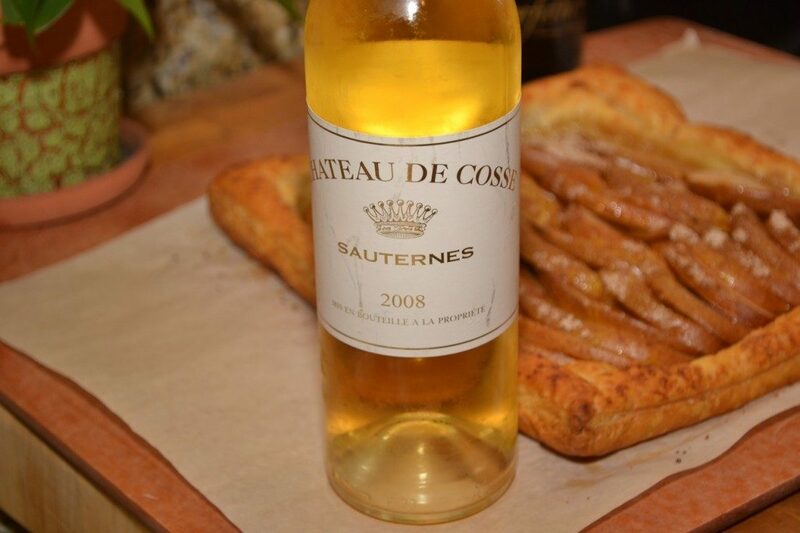 The coup de grâce of this delicious project was pairing of Sauternes with the tart. I selected the Chateau de Cosse 2008 Sauternes ($20), which is part of the Domaines Barons de Rothschild family. The bouquet is amazing floral, sweet honey and ripe apricot. This wine is much more viscous than the previous two, providing a very rich experience. The palate is a sweet savory experience, and each sip makes your mouth water. There are amazing flavors of honey and dried apricot, mixed with hints of flowers. This was the best pairing in my opinion. Now the exciting part. 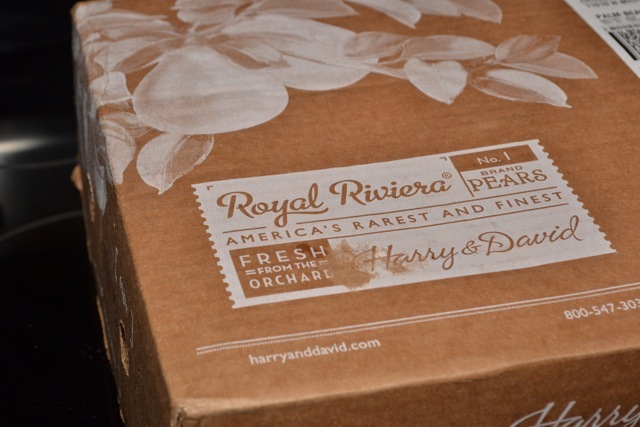 I’m happy to be giving away some of Harry & David’s Organic The Favorite® Royal Riviera® Pears. 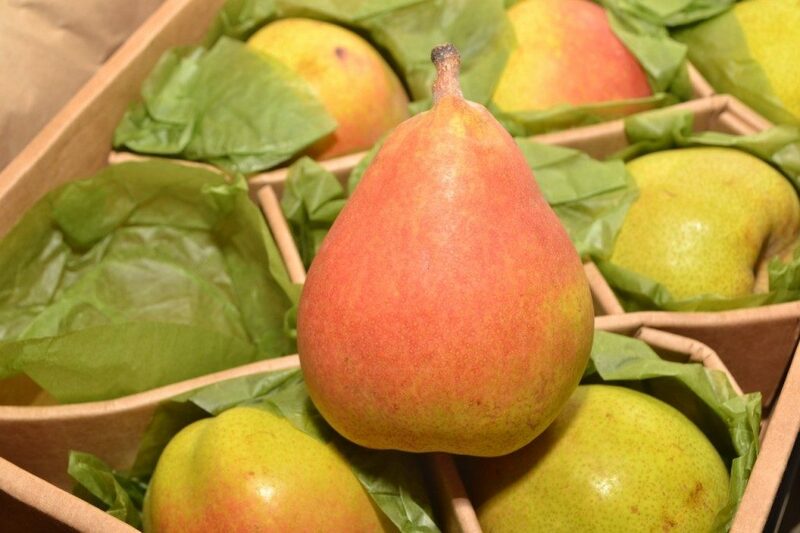 One lucky person will win 1 box of beautiful organic pears ($34.95 value)! H&D invented the fruit of the month club. At least one shipment of these pears is sent to every member. You can savor these delectables yourself, simply enter the giveaway below. There are multiple ways to enter, so be sure to catch them all! This contest is open to US residents only. The winner will be chosen Sunday 12/15/2013. I will need to forward a mailing address for the winner by Monday 12/16/2013 to Harry & David! Remember that Sharing is Caring. You should not only share this post with your friends, but share some wine and pears with them!